By 1991 I had been seeing my boyfriend for six years. Six whole years! We had travelled Europe together, lived in our own little flats in France together and studied together. When you are 23 years old, six years is a sizeable chunk of your past, and it's an even greater part of the past you have memories of. Any doubts I might have had before my big day were quashed by the knowledge that I had invested so much of my past in that relationship, that it would be madness to start again. After all, hadn't my own parents married even younger, hadn't my mum been 23 when I was born? And my husband-to-be was 27 so we were a fine age... I loved speaking French, I loved France and French culture so I'd have been mad to turn away the opportunity of being married to someone I could speak French to all day and all night. I was even getting an exotic name in the package. It was perfect... except it wasn't. I think more than anything I was in love with an idea but my greatest mistake of youth was that in looking backwards, I forgot to look forwards. Yes, six years was a large investment, but the sixty I had ahead of me should have set alarm bells ringing. I just didn't have the life experience to hear them. 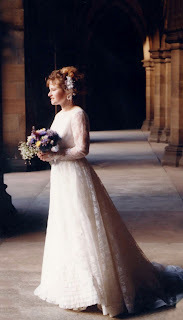 Of course, if I could talk to 23-year-old me I could not advise against it because the children I got from that marriage make up half of my life today, but let's just say that if my own kids suggest marrying at 23, I will be first in the queue to suggest living together for another six years first! If my marriage was underwhelming and lonely, my divorce was spectacular in its bitterness and has, by today, reached a point I would never have chosen to go to myself. So today I will celebrate thoroughly the fact that I now live with my best friend, a man chosen when I'd reached the right level of maturity to commit my life to someone, and with my large blended family and I will not regret that other universe for one second in time.